Morgan Meis on the language of Cy Twombly's art @ The Smart Set. In the early 1950s, Cy Twombly worked for the army as a cryptologist. 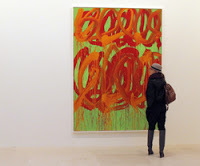 That fact seems hugely significant since Twombly was one of the more elusive artists of his generation. That is what the conventional wisdom says, anyway. In this case, the conventional wisdom is probably correct. Cy Twombly's art first acquired its distinctively elusive characteristics when he started using letters and words in his paintings. In a number of his paintings can be found the letter “e.” Twombly painted his “e”s in a cursive style most of the time, drawn with a freehand nonchalance. The “e”s in Twombly's paintings often look like something you would find in the notebook of a young person first learning to write in cursive. This person is drawing the same letter over and over again in loops in the attempt to get the form of the letter right. Maybe they have learned how to make one word and they are copying that word over and over again with varying success.Letters, in general, are meant to make up words and words are meant to make up sentences and sentences are meant to convey meaning. Breaking sentences back down into individual words and words back down into individual letters has the opposite effect. Meaning is reduced, taken apart, decomposed. Still, the letters and the words contain a lingering residue of the meaning they are meant to lead toward even if they never get there. In Twombly's paintings, the individual “e”s looping off one another across the canvas contain a lot of promise. There is something tantalizing about the fact that they might mean something after all.